In Biltmore's Archives, a cherished diary detailing menus for luncheons and dinners served between Sepember 27 and December 31, 1904 is safely stored. Kept by estate cook Ester Anderson, this book includes menus and the number of guests expected for special occasions such as Thanksgiving and Christmas dinner, where both time-honored favorites and unique recipes were listed. Knowing that tastes have changed over the last century, we asked Biltmore Chef Spencer Hilgeman at Village Social to create recipes inspired from the archival 1904 menu book for a modern Thanksgiving celebration. In this blog series, we'll detail Chef Spencer's recipes and video instructions for an appetizer, entree, and dessert inspired by the very same menu the Vanderbilts enjoyed at their 1904 Thanksgiving Dinner. Oyster Shucking Tips: Use a folded towel to protect your hand. When using the shucker, rather than pushing hard, jiggle it like a key to pop the hinge of the oysters. Once open, be sure to remove the muscle from the bottom of the shell for easy eating. Combine ingredients for each sauce into separate bowls, allowing mignonette to chill for two hours. 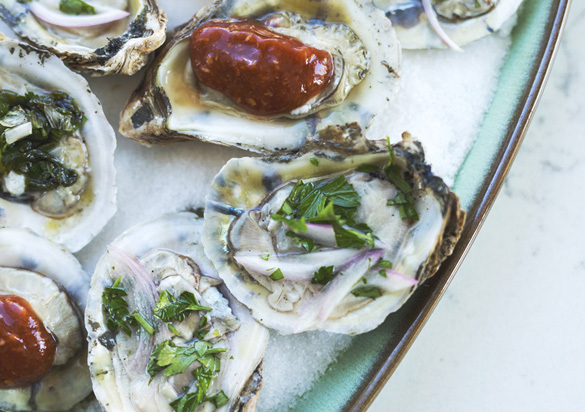 Top a platter of oysters with any or all of the three holiday sauces. Enjoy with Biltmore Brut Sparkling. This refreshing blend of Chardonnay and Pinot Noir offers a good balance of citrus with hints of honey and apricot. Follow these links for recipes and video instructions for the main entree, Blood Orange Roast Turkey, and for dessert, Apple and Currant Mince Pie with White Cheddar Crust. My husband & I had privilege of being there in September & ate at the stable which we had creamed brussel sprouts....would love to have the recipe!